Kitchen Aid plate on the bottom. Although I’ve griped repeatedly about the sausage stuffer on the Kitchen Aid Stand Mixer, I really can’t fault the actual meat grinder. The one thing I do find problematic is the choice of grinding plates. 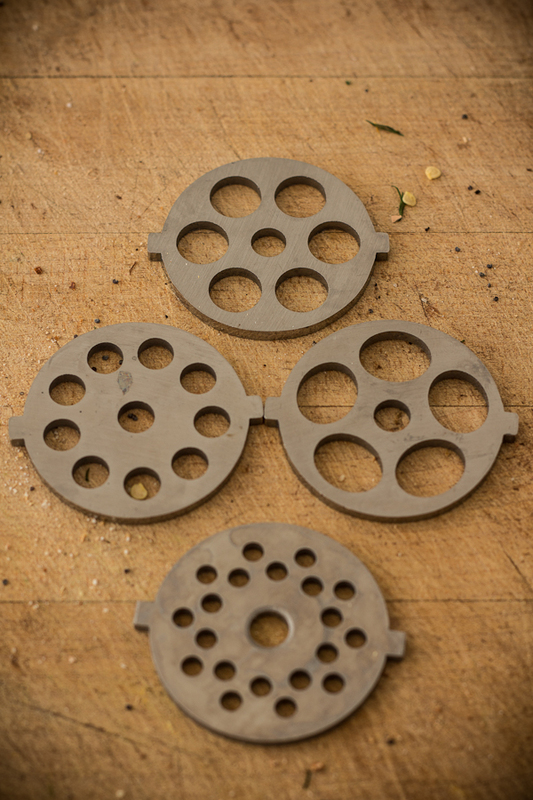 You only get two sizes of grinder plates: small but serviceable and too small to use. The grinder plate determines the size of your mince, so if you want a larger, coarse grind, you’re out of luck. But in “another reason I love the internet” moment, I found like-minded machinists cutting their own custom grinder plates out of stainless steel. While they’re not cheap ($7-9 a plate), they really open up the versatility of the Kitchen Aid. So I purchased three different gauges off ebay. Now I’m excited to try them out on a dry-cured lamb sausage this weekend, which I’d like to make in the style of a coarse-ground sopressata. The middle size will be used for the pork fat, which should produce modest sized pieces, but not the large cubes I hand-cut for my caul fat salami. The largest size would be used for much larger chunks of meat and fat, if I wanted to do a particularly coarse salami. Sure I bought them through an ebay shop called butcher-baker. Here's a link to one of the plates, but they also sell them individually and in various sets (3 plates, 5 plates, etc). I am thinking of buying this STX TF 4000, will I be able to use these additional plates withmy device? 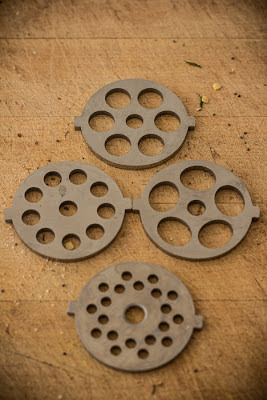 what is the best size grinder plate holes for making the best hamburger? Really it's a great article. thanks for the guide you can see my meat grinder We make sure that all pcso lotto result that we post are accurate. However, we still encourage our visitors to visit the official PCSO website and verify the game results from there. Moreover, white LED technology, while continuously improving, does not yet have the optical color and brightness that consumers have become accustomed to with incandescent lights. However, the power savings can fasadskylt be significant, for example, in California the energy commission has adopted efficiency standards for residential and commercial buildings. These standards, Title 24, have accelerated development of LED illumination technology. thanks for the guide you can see my meat grinder We make sure that Wishes have no religion like hollywoodneuz.net wishes for Christians are same as that for Muslims and Hindus or Buddhists and all other religion. There are two sides to the fact that Singapore is multilingual. If you want to immerse yourself fully in a language, it Corporate / company dinner venues in Singapore is probably best to go to a country that operates solely in the language you are learning. Italian is best learnt in Italy, and it is best to go to France of you want to learn French. you can download all your favorite drama download sites apnetv.in in different languages. keep your weekend very interesting with latest bollywood movies, Latest Bollywood Show download sites. Very Nice Your Site. California the energy commission has adopted efficiency standards for residential. principle, hum an excerpt from a known movie and see where it takes you. One may remind you of a superhero coasting the skies in his red cloak. Too many dangers can occur when you try to get a furnace installed on your own, especially if this is being done on a gas furnace. No experience with installing is dangerous for anyone, so if you really want your Goodman furnace furnace to work correctly and keep your family safe, then hiring help is definitely smart. One of these services includes the service of uncontested divorce paperwork for the couple that wants to get separated from this demolished relation. The couple does not have to go through this process that drains their pocketbook or their emotions. Globex Documents provides all the paperwork and the divorce services facilities that the couple needs at a very affordable price and provides all the documents online at a very affordable price. These documents are not blank or self-fillable. In fact, all the documentation is complete and fully authorized by the court and made by professionals. All the task the couple has to do now is to sign the document and submit it to the court and the divorce procedure will be completed.